Bharti Technologies is the leading supplier of time attendance system and time tracking for small to medium-sized businesses in Dubai and Abudhabi. Our time attendance system is intended to be utilized by most normal PC clients, with no database and programming abilities required. Select from complete solutions featuring time attendance system and a biometric (fingerprint), RFID, or barcode time clock. Being perfect for organizations of any size, time attendance systems guarantee that the highest esteem resource of the organization, employee work time, is utilized viably. Time and Attendance access control series featuring biometric fingerprint verification sensor and technologies, the devices are used to install on the door entrance with built-in time attendance system management software to better manage multi-access points attendance control and duty roster arrangement. We provide all sorts of time attendance systems from a leading manufacturer at market price in Dubai, Abudhabi and the Middle East. Bharti Technologies engaged in delivering, dealing, and trading a wide range of best Biometric Time Attendance System in Dubai and Abudhabi as well. You can enhance the procedure for monitoring employee attendance and personnel access in your company with a reliable biometric time attendance system. Biometric Time Attendance Reader ensures that no employee can punch in for another, which eliminates time fraud and reduces payroll costs. Because every person’s fingerprint, iris, voice, retina face, hand, vein, and signature are unique, a biometric time clock provides a quick, accurate, and reliable way to record “In” and “Out” punches for each employee. That is why many companies now employ biometrics. In recent times, there is a large number of Biometric Time Attendance Systems that are commercially available. Such Biometric Time Attendance systems are based on unique characteristics of human being. We provide easy to use biometric time attendance systems in Dubai and Abudhabi for managing employee attendance using a finger, eye retina, palm, and voice pattern. The most common, reliable and successful system is the one based on Finger Prints. Users are supposed to put their thumb/index finger (or any specified finger) in the finger reader. The system then compares the fingerprint that is read with that in the central database for authentication. Most of the Biometric Time Attendance Systems do not keep an image of the fingerprint but a template. A template is basically a number that is calculated based on various characteristics of the fingerprint. Such an approach is desirable so that unauthorized persons may not sneak in unauthorized images of a fingerprint in the database. When a Fingerprint is to be matched, it’s ‘template’ number is computed and compared with that stored in the database. Most systems allow for dry, greasy, chaffed and minor cuts on the fingers. The other biometric time attendance systems are based on ‘Retina of the eye’, Palm, photograph or voice pattern recognition. The Palm-based systems take the image of the palm from various angles and compare the same. The system that is based on Finger Prints is the most popular and economical. 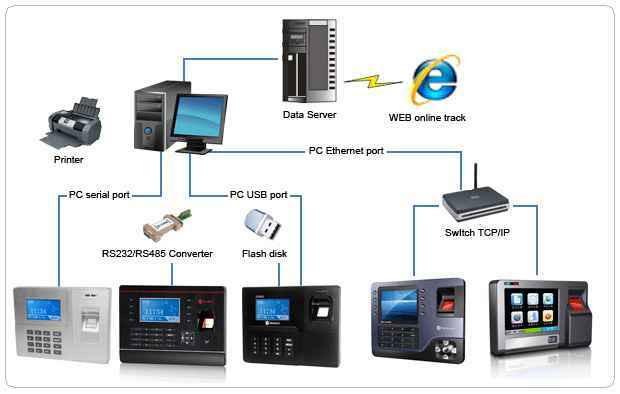 Perfect for companies wanting an economical PC Based and feature-rich Time Attendance System software and terminal solution. With these solutions, your company will have an immediate ROI simply by eliminating payroll errors and avoiding the time consumed by the Accounts Department to manually calculate the Attendance. Easy to use, powerful time attendance system allows you to automate your company’s timekeeping and attendance tracking. With built-in setup wizards and simplified daily operations. The Time Attendance System completely eliminate paper time sheets. Accessible anytime, anywhere via the internal emails, giving maximum control and convenience to supervisors, schedules, and agency heads. The Attendance Cards serves as an easily available Identification card as well, unlike the conventional Electronic Time recorders.